There is no debating that this home is Southern Traditional architecture. But what happens when you prefer a less formal, more casual image? 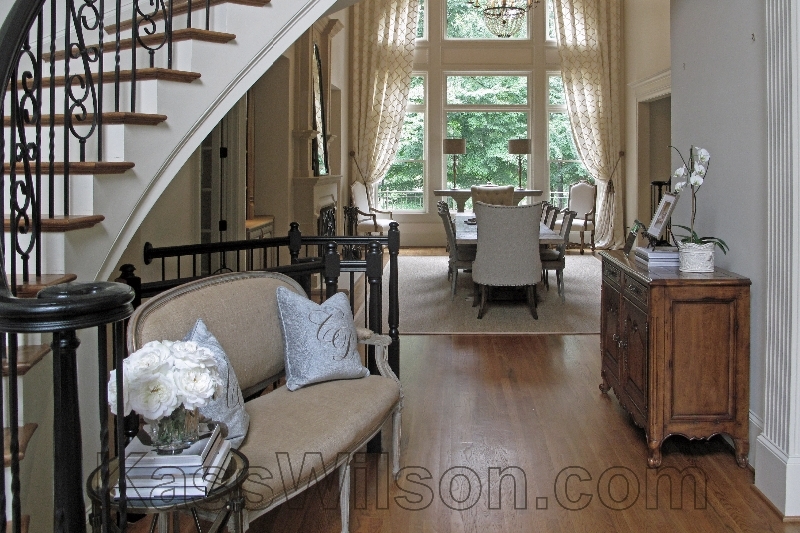 How do you preserve the elegance of traditional style but also create a more current image? The answer. . . shift into neutral! That is the dilemma that challenged this client. She was seeking a light, airy and more current look. There were obvious factors to consider: the furnishings and the color palette. Designer Belinda Giddens of Outrageous Interiors in Suwanee, GA was able to assist her with selections more consistent with her personal style. 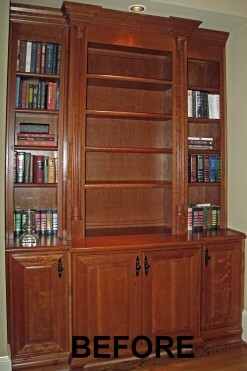 Yet, the pieces that did not fit in this picture were the traditional bookcases. 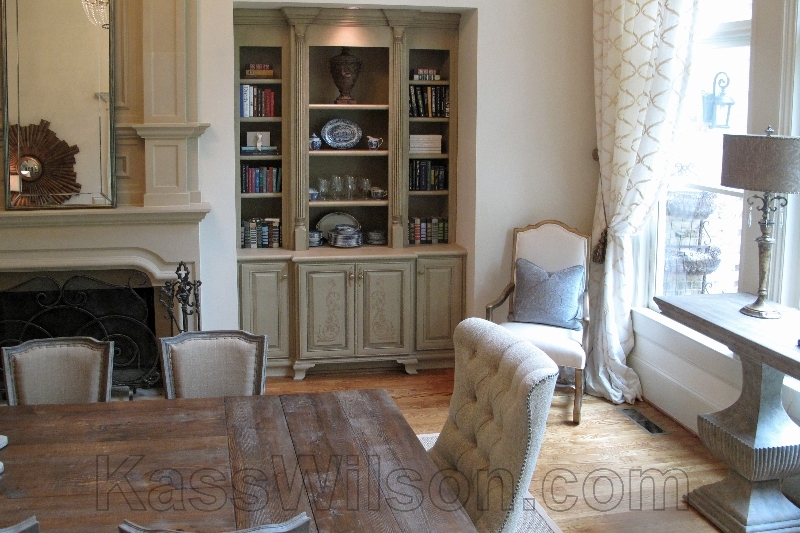 They were beautifully crafted with detailed formal architecture, but the wood tones were too strong for this updated space. 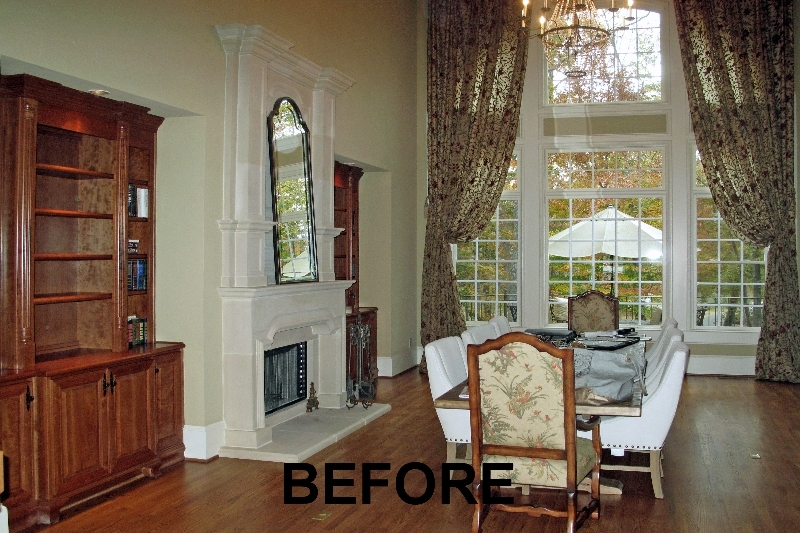 Making a decision to paint over wood was not taken lightly and no ordinary faux finish would do. The decorative artistry on these cabinets needed to be spectacular in order to maintain the statement of quality and elegance in this home. 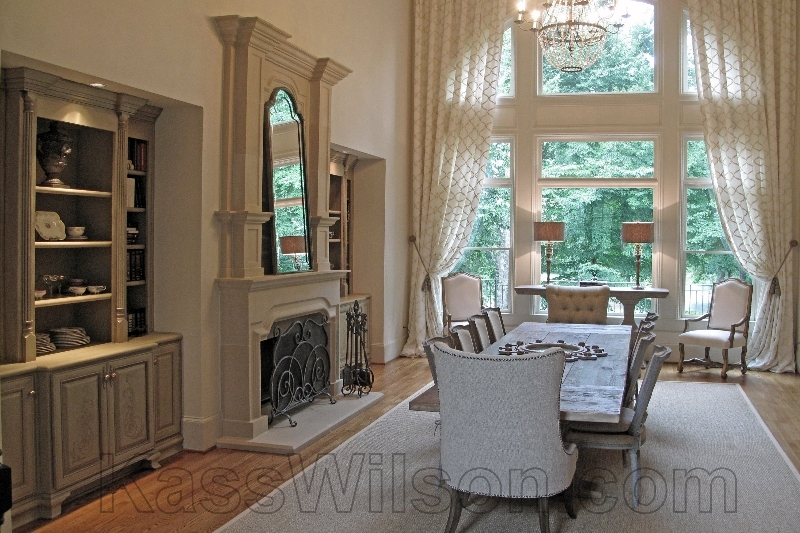 Inspiration for the colors was taken from the new furnishings that incorporated the warm neutrals. 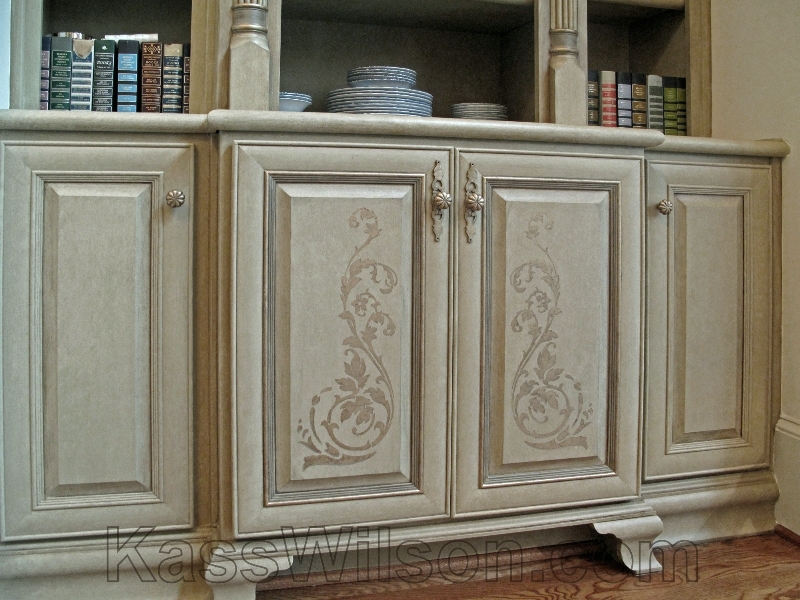 A soft but subtle distressed faux finish was applied to complement this style. Enhancing the architectural details was accomplished with small touches of the deep taupe, highlighted with bronze and gold. A graceful design was stenciled to the front of the doors to maintain the consistency of the traditional style. We welcome your feedback. Please leave a comment below. Special thanks to Belinda Giddens of Outrageous Interiors in Suwanee, GA, Cutting Edge Stencils, and Dixon Painting. I love everything about this transformation! The fireplace even matches the built-in cabinets which brings unity to the wall! 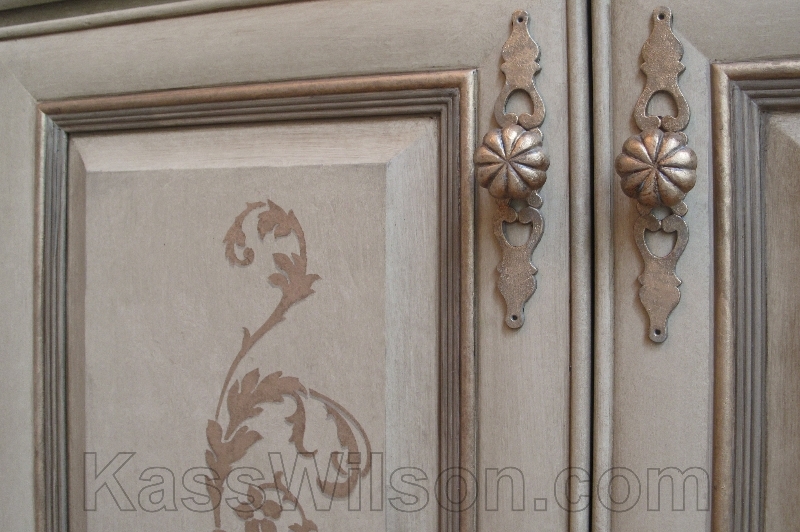 As always Kass, the beauty is in the details: the hardware, the stencil design and color, the elegant cabinet inset trim, – all are perfect to what you were trying to achieve! I am in awe of all of your projects, but this is one of my favorite!! As always another beautiful execution down to the final detail I enjoy your monthly feature so much! Beautiful transformation! Love the stencil. These look beautiful! I know some people cringe at the idea of painting a solid wood piece of furniture, but sometimes it is what you need to do! When the wood is damaged or faded, a coat of paint can work wonders! It looks like you’ve done a wonderful job with this project. Thanks for sharing! I’m interested to know what color was selected… it’s gorgeous… crucial though to select the right shade, and paint mfg… not all paint is created equal! 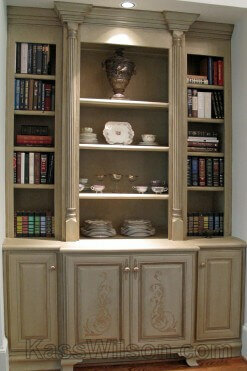 Trisha, The base is Sherwin William ProClassic Enamel in Windsor greige. Gorgeous. Love, love, love it! I’d like to do that to my kitchen cabinets. Sure would lighten up my kitchen! Love it! The more transformations like this that I see, the easier it is for me to finally take the plunge.